You made a big batch of caramelized onions and froze some, right? If not, just throw a few thinly-sliced onions in your pan over high heat and cook them until they have softened and sweetened and proceed from there. I also like this recipe with a few leeks in place of the onions. Frittata with Chevre and Caramelized Onions: Whisk eight eggs with a few generous pinches of salt and pepper and a good splash of milk. Stir in 1 1/2 c. caramelized onions and a good handful of chopped parsley. Heat an ovenproof skillet over medium heat, pour in a glug of olive oil, then add the eggs. Cook undisturbed until the edges are set, then dollop chevre all over the top and transfer to a 375 degree oven to finish cooking. Alternatively, you can just leave the frittata on the stovetop, browing the top under the broiler at the very end if desired. Oh, to be in the middle of goat cheese country! But I am lucky and have a connection to some excellent goat cheese myself. :) And I know, eight eggs is crazy! But I like to make big frittatas to have some leftover to slice into sandwiches the following day. Anything with chevre is great! 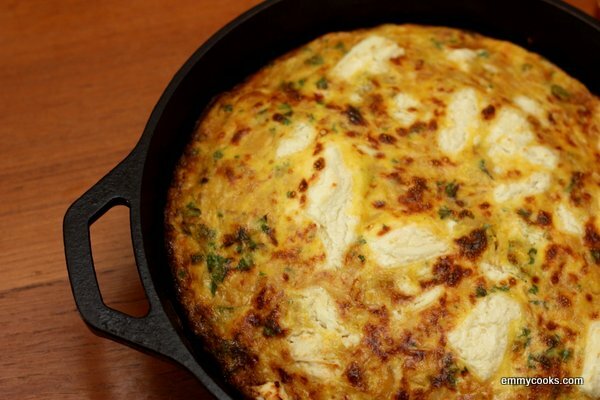 I love goats cheese frittata, it really is delicious. Sounds really delicious! Anything with Chevre makes me happy! I love the name Feather for chickens! I have friends in Seattle who have had backyard chickens forever (Ravenna neighborhood). I’ll have to ask if they participate in the tour. You were a chicken hipster? ;-) Hehheh…couldn’t resist that! We have been talking about raising chickens, I did that as a child. It can be very rewarding – but I love how yours wasn’t happy unless he got your tomatoes! Yum! This is totally in my wheelhouse – love onions, love goat cheese, love eggs! And I also have a strong desire to own a little tiny brown & white goat….. Your chickens named Feather remind me of my childhood pets, Froggy and Mr. Froggy. Can’t wait to try this frittata, freezing caramelized onions is really clever. Chickens are SO funny. I loved reading about your broody hen. Our “girls” sure aren’t earning their keep right now. They think it’s too hot to lay…..or they are still traumatized by the visit from a fox…..or they are too busy eyeing the new flock of girls….or the angle of the sun is wrong…. I love that you have chickens with the same name =) Are yours the same kind? I have 2 sets of same-named hens. (a pair of buff orpingtons and a pair of black australorps). No one is currently broody…but we are in full on molt with at least 1/2 our flock. They look awful! And, I now want a frittata!